My friend, Tanya, from The Kitchen Bench, contributed another worth trying and worth dying for recipe, roast pork belly. 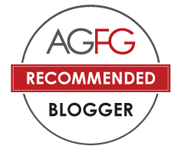 I believe most people have done pork belly at home, but read on to discover what Tanya has to say about pork bellies. Tanya’s cooking skills and culinary techniques is a treasure from her Italian heritage. Now, having her first cookbook, Blending the Cultures, due to be published and released next week, Tanya’s recipe today may give you some preview of this fantastic new book. Tanya Bartolini grew up in the lushness of Australia’s tropical north Queensland. She represents a generation of Italo-Australians who, despite living 15000 kilometres from the home country of grandparents, have embraced the culinary traditions of their heritage with gusto. Family and food are part of her DNA; as essential to her being as oxygen. The book, Blending the Cultures is more than a family history, it is a sharing of precious family recipes that add to Australia’s gastronomic mix and encourage families and friends to gather, cook and share a meal together, creating memorable moments along the way. The book retails at $39.95, consisting of 176 internal pages and hard cover. It can be purchased here. As i sit here with my glass of icy cold pinot grigio on this warm summers afternoon I feel intoxicated, not because of the wine I am enjoying (although a few more glasses and that may be the case) but due to the smell wafting from my small kitchen oven. My pork belly is busily crackling away in the oven and the smells, oh my goodness the sweet smell. There is something to be said about the simplicity and joy that a roast can bring someone as it cooks away in the oven and today it is my roast pork belly stuffed with prosciutto and sage that is tantalising the tastebuds and senses. Whilst a Sunday roast is not a tradition I uphold every week, when I get the odd quiet weekend I will often take the chance to cook one and today was an opportunity to experiment with a piece of pork belly. As opposed to my normal approach with pork which is drying out the skin and then salting and roasting I decided to try out a method of first boiling the skin in water to enhance my ability to derive a good crunch. I must admit the result has been very successful and one I will use again. I hope you enjoy the recipe I am sharing with you, my husband who is not usually the biggest fan of a roast pork really did enjoy this and I think pairing it with my shaved fennel salad was the winner. On a warm summers day fennel which is always a winner when married with pork, uncooked was the perfect accompaniment. 2. Score the skin of the pork belly, if you are not sure how to do this or don’t have a knife sharp enough ask your butcher to do it for you. This is important in getting a good crackle. 3. Fill a flame proof baking pan with 1 cm of water and bring to boil on the stove, place the pork belly skin side down into the water and allow to cook fro 1 minute. Remove from water and set to one side. 4. In a mortar and pestle prepare the paste for the pork by placing the garlic, fennel seeds, pinch of salt and the finely cut sage and rosemary. Pound into a paste. 5. Rub the pork belly with the paste, do not rub the skin just the underside or meat. Massage it into the meat. 6. Then in your baking tray (make sure the water you discard the water from the step above) place the carrot, onion and celery. Then on top of the vegetables place the pork belly, skin side up. Rub the skin with salt. 7. Place the pork belly in the preheated oven at 170 degrees for 5o minutes, then turn the heat of the oven to 250 degrees celsius and cook for a further 30 minutes. You may find that if you are not getting a good crackle on the skin of the pork that you will need to turn your oven to grill, this should get the crackling to a good consistency but just make sure you watch it closely or else it may burn. 8. Serve with potato wedges and my Shaved fennel salad especially in summer when you are looking for something just that little bit lighter. Tip #1 – cooking the pork in water skin down for 1 minute helps to develop a good crackle on the pork. Tip #2 – if you are cooking for more than 2 people, say 6 then I would use at least 3 carrots, 2 onions and 2 celery sticks and obviously a larger piece of pork belly say 2 to 2.5kg. Adjust the cooking time based on the following, 500g = 30 minutes. 1. Combine the apple, fennel, silver beet and lemon juice and olive oil and allow to marinate in a large bowl for 30 minutes. 2. When ready to serve mix through the feta cheese. Tip # 1 – if you don’t like a lot of lemon juice then I would cut it back to the juice of 1 lemon. You can never go wrong with a pork and apple combo! YUM!! Love roast pork belly! An unbeatable dish ever! Damn, i love that crispy crackling! 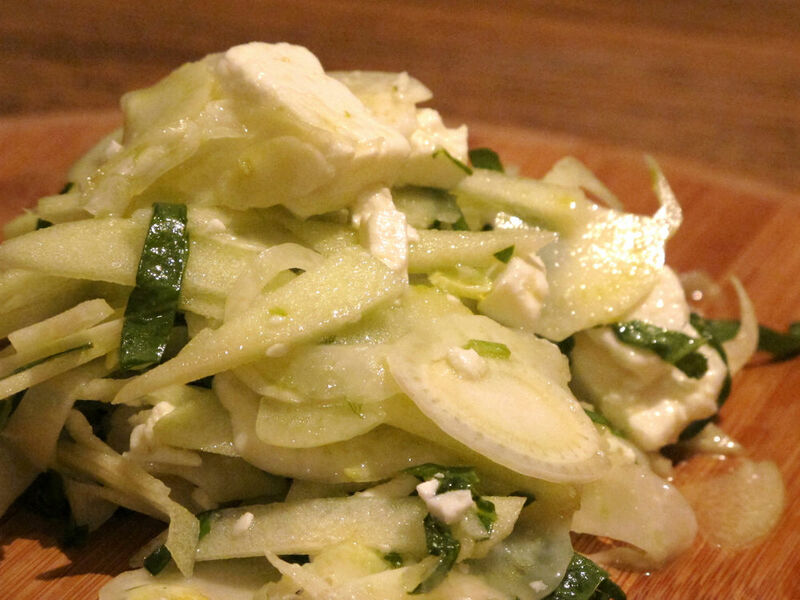 the fennel and apple salad made me not feeling guilty just by reading this post! fatty and crispy pork with refreshing fennel and apple sounds heavently! Glad you like the pork. I just can’t resist a good pork crackling with running juices. Looks so fabulous! Wow, so mouthwatering! 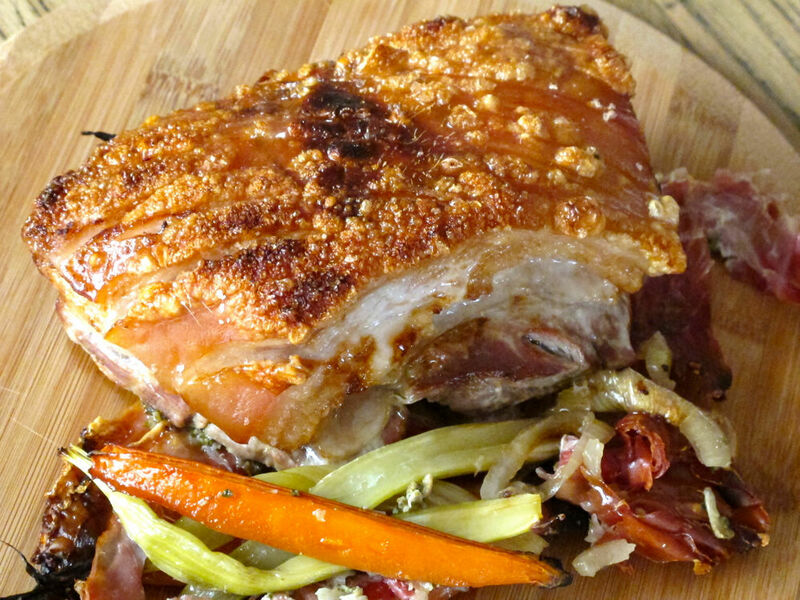 Roasted pork belly alone is tasty, but with prosciutto and sage–even better! 😀 The fennel and apple salad looks delicious as well, and a nice refreshing pairing to the pork belly. Thanks for sharing! Glad you like it! I always love the apple pork pairing too.